Small Cabin Forum / Cabin Construction / Which way to put trusses? So there was finally a break in the weather from weeks of -50f up at my lot. I went up to check on my trailer and shovel the roof. There was a lot less snow on my trailer then I thought because the wind has been blowing it off but there was a good 6foot snow drift going up my trailer. 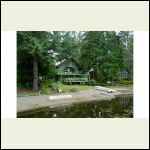 When I go to build my cabin would it be better to have the gable end face the lake or the other way? I'm thinking if I dont have a gable face the lake snow will blow up into the soffit? But gable ends facing lake is traditional, and lots of overhang. How about rafters vs trusses and exposed on overhang? Close it in only at rafter tails, leave gable overhangs open? Set overhang out far enough too, sun low in horizon in winter, allows sun to come through those windows and heats your home. High in summer, keeps sunlight out and cooler. 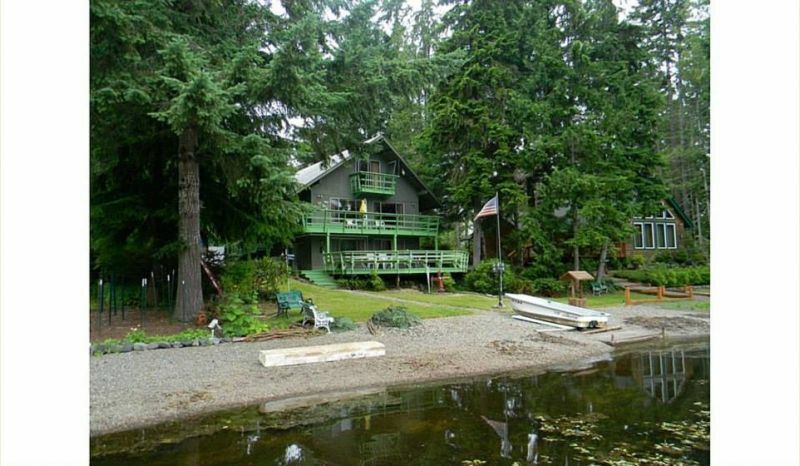 My dad did this to the house I grew up in, he built it, was on the lake facing south, I remember massive solid doug fir beams, load bearing ridge etc, Rafter ties/floor joist for upstairs were 4X14 every 4 feet. That's a nice place! I work for a local building supply company with a truss plant and with large snow loads and being engineered trusses I'd have piece of mind knowing my cabin will be ok. I work doing interior work finish carpentry drywall paint etc and not much of a framer and wouldn't know where to even start with doing rafters. Since you are doing trusses why not do a hip roof. The truss factory can design it. Reason is that a hip roof is stronger than a gable. Hip roofs also don't have the gable end wall which is one of the places high winds get into roof assemblies and start blowing them out. There were four houses with hip roofs that were the only surviving homes in an area of Houston after hurricane Harvey. I would not worry about snow blowing in soffits. Never seen that happen. Hip roof is not a bad idea. At my previous job I worked in restoration for 9 years and I've seen beautiful homes on lake superior that end up with 4foot of snow in their livingroom and kitchen with their ceiling on the floor from the high winds blowing snow into the soffits. And toyota's idea about sizing and placing the overhang to be shade in summer but allow the lower level winter sun to hit the glass is good, except that with today's Low-E windows the winter sun hitting the glass doesn't provide much benefit. But the Low-E windows do make a noticeable difference on keeping the interior heat inside in the winter and are also useful for keeping the inside cooler in the summer if the sun's rays to hit the glass. Still a good idea to make the eve overhang big enough to shade the windows as much as possible in the summer. I'm trying to figure out my lay out and I'm keeping the sun in mind. The cabin will be faces west with the sun setting in the west. So the front of the cabin will have a large patio door to the livingroom and windows to master bed and kitchen. Sun rises in the east with only a few windows in the back to the guest bed and bath livingroom. With the midday sun from the south I have trees and next to no windows on that side. Hoping to keep the sun out and not be as hot in the cabin mid day. Does this sound right? I would consider if the snow would fall on the deck in front of doors. Snow?... put a dormer roof over the entrance. ?? I'm building my cabin 20x28 and I think I'm going to spend the extra money and get the 28' trusses so snow will fall to the sides and not on to the deck and I front of the back door. And with rain itll will fall to the sides and down the bank to the lake. I think that will work and look the best. You will also have a large energy heal . Where the rafters and wall meet. I did a 4’ overhang with a 2’ tail for a 6’ overhang. On my house. Left me with plenty of insulation and ventilation room. And diverted the drip line 6’ away from my foundation.